Part of what makes writing for Just Games Retro so much fun is that even though JGR’s been chugging along for over fifteen years, we still manage to break new ground sometimes. My first review here kicked off our Nintendo 64 section, and in the short few years I’ve been aboard the mothership, we’ve covered peripherals, arcade games, an Apple II game, CD-i games, and now, we’re poking our shovels into the earth yet again, this time into the Game Boy library, and let’s face it, is there any more of a fitting place to start than with the face of Nintendo himself, our friend Mario? 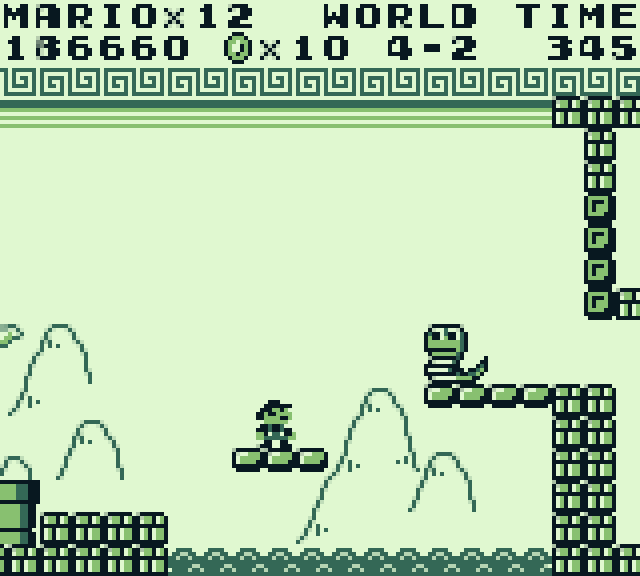 Of course not, so dig in and pull out today’s title, 1989’s Super Mario Land. Mr. Potato Head is after Mario with a vengeance. 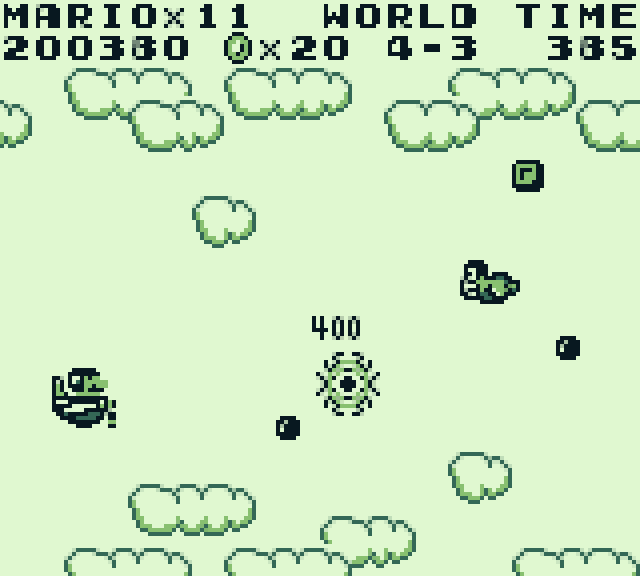 Super Mario Land should look and feel very similar to big brother Super Mario Bros., with a few changes to start. 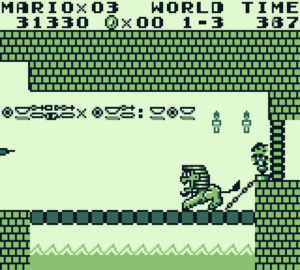 Yes, once again, you’re out to save a kidnapped princess, but this time, you’re not saving Princess Peach/Toadstool from Bowser, you’re saving Princess Daisy from Tatanga the alien, and instead of hopping and bopping through the Mushroom Kingdom, you appear to be roaming through real-world locations like the Egyptian pyramids and Easter Island. The non-canonical setting aside, this is definitely a Mario game. Most of the classic Mario mechanics are intact here: you start as tiny Mario, jumping on enemies’ heads, collect mushrooms to become larger, scoop up Fire Flowers for your projectile attack, slip down various and sundry pipes to find secret areas, and soak up coins for extra lives and stars that provide temporary invincibility and the power to plow through enemies like a hot knife through butter. That being said, there are a few nifty changes here that do add a bit of distinctiveness to the proceedings here. For one, instead of your fireball attack bouncing along the ground, it now ricochets at 45-degree angles, meaning you can bounce it off the ground to attack flying enemies without having to hop up to their level, which takes a bit of getting used to at first, but turns into a pretty useful tool at times. Oddly enough, your fireball can also collect coins, as well, which is a helpful way to grab out-of-the-way coins without having to risk making tricky jumps or intentionally taking damage to fit into small spaces. On the whole, everything handles pretty well, too, the classic and simplistic Mario action translates very well to the smaller platform; two buttons and a joypad are all you need. I should point out that some things like Mario’s running momentum and the jumping mechanics feel a bit stiffer than Super Mario Bros., but after a few minutes of game time, you’ll adapt to them just fine. 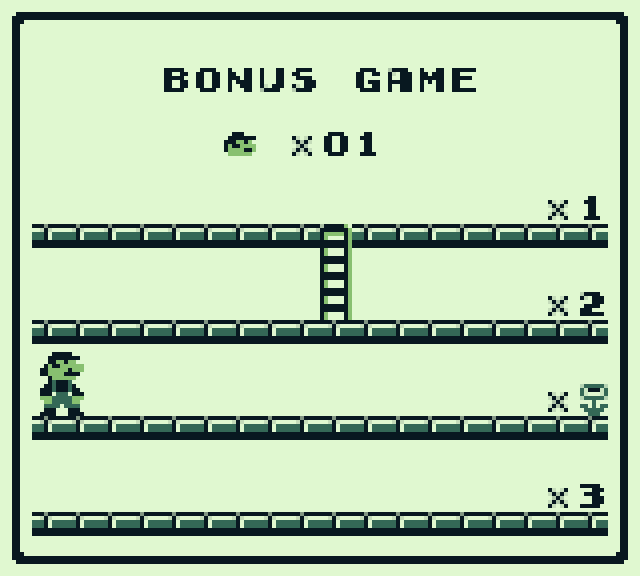 Sadly, though, the flagpole at the end of each stage has been replaced with two exit doors; if you reach the one at the top, you get a bonus game where you’re guaranteed to get a Fire Flower at worst and up to three 1-ups otherwise, so it’s worth taking that little extra effort to reach the top. 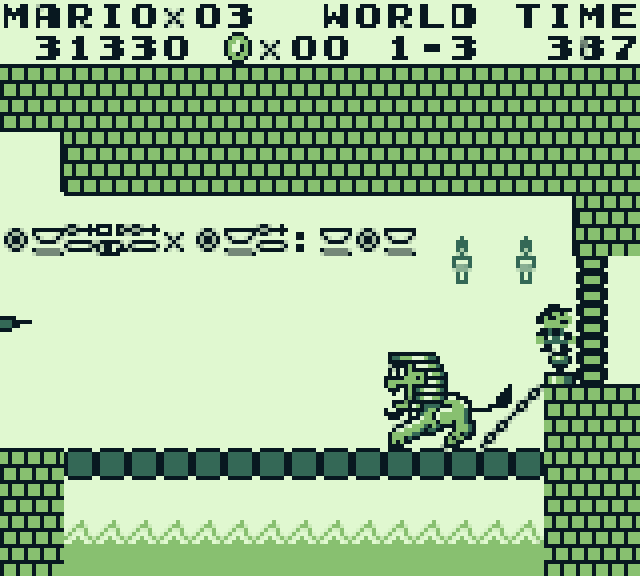 Much like Super Mario Bros., the end of level boss battles can be won either by blasting the bosses or pressing the plunger behind them, although it does feel a bit weird taking joy in dropping a bridge out from underneath Not Bowser. One fun little addition to be found here is that there are a couple of stages where Mario takes to the sea and air and the game turns into a side-scrolling shooter along the lines of R-Type, and since there are only a couple of stages like that, they don’t overstay their welcome and detract from the core Mario action. I was very pleasantly surprised to see how well the designers managed to cut corners to cram everything onto a Game Boy cartridge without losing too much, especially since SML came out extremely early in the Game Boy’s career. For example, like the aforementioned flagpole being cut, familiar Mario foes like the Lakitu and the Hammer Brothers have been removed, there no swimming levels, which I imagine was done to avoid having to give Mario swimming animations. Koopa Troopas populate the levels, but instead of being able to kick their shells at enemies after stomping on them, the shells explode after a couple seconds. Certain enemies like Goombas or Bullet Bills also look considerably scaled back, but they’re still very much identifiable. Not quite the same as dunking the real thing. 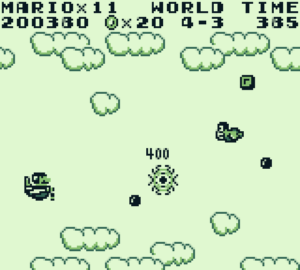 Even despite the corner-cutting and re-scaling, Super Mario Land looks and sounds great. The background music is very excellently done, especially given the hardware limitations, and although they don’t have the memorable staying power of the original Koji Kondo works on the NES, they’re still pleasant and distinctive enough. 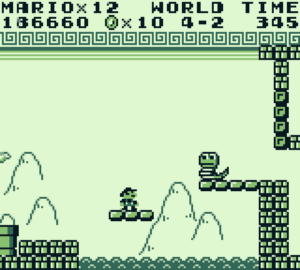 Mario’s sprite looks good, and his animations are smooth, if not a bit minimalistic. Enemy designs are solid, considering how hard they had to break from the traditional Mario lineup, as this time, Mario gets chased down by things like angry Easter Island heads, vampires that pop back up after you squash them, angry fire-breathing seahorses, and bony fish that leap out of the water as you hop over gaps. As you would probably expect from an early Game Boy game, this is not a terribly long game. 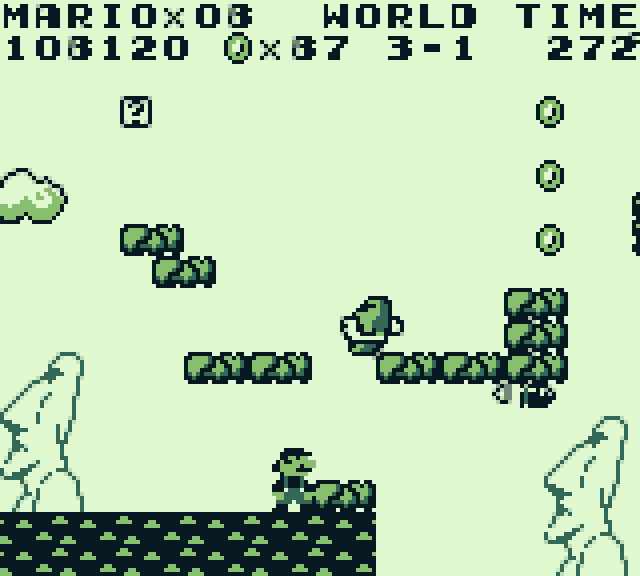 Super Mario Land features four worlds instead of eight, and three stages per level instead of four, but the levels themselves feel a bit longer than an average Super Mario Bros. stage. Of course, part of that is because there are recycled elements to each level; there are a couple of instances where you’ll pass literally the exact same scenery a couple of times in a stage, but even that’s generally unobtrusive, and if you’re diligent about finding pipes and secret areas, you may not even notice at all. Now granted, only twelve stages isn’t much, but the spirit of the Game Boy was to have something to play on the go, not exactly to sit down and plow through an lengthy epic, so it works fine, and for those of you clamoring for just a little more content, after you beat the game, you can start it a second time in Expert Mode, which features more enemies and changes up their locations, giving you pretty much a fresh game to mow through, and after a second playthrough, there’s an unlockable stage select. Mario and Mr. Snake here having a nice awkward silence. 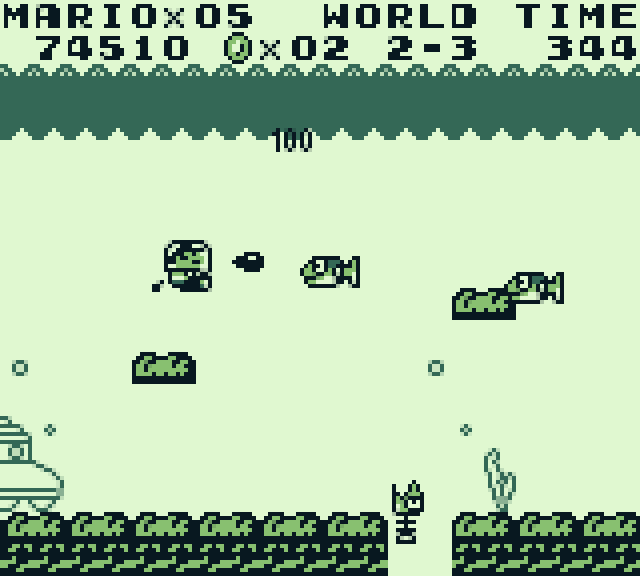 Super Mario Land, as it turns out, is a pretty solid little game. Big surprise, I’m sure, but I was happy that I didn’t feel a need to judge it on a “well, it WAS a Game Boy game, so…” sliding scale and could just enjoy it for what it was. Yes, the Super Mario Land would go in its own direction later in the series, and this iteration definitely feels more like a scaled-down port of Super Mario Bros. more than a completely different game, but hey, there’s no reason to spit in the face of a formula that we know works, and there’s enough quirks here that it doesn’t entirely feel like recycled content. It’s pretty obvious that a Mario game would be one of the first titles out the door for a nascent Nintendo system, and this is definitely a solid one to start off with. I’d recommend it for anyone looking for another tasty scoop of the Mario recipe we’ve come to know and love, especially one that strays a bit from the established canon in terms of enemy design and setting. Just try not to get run over by an angry Easter Island head along the way. Retains most everything that makes a Mario game good, the Expert mode adds a bit of replay value, and some fun wrinkles to be found here. If you were already sick of the Mario formula, this probably isn’t going to help. Another good review. One of my faves.